There have been several recent scientific papers about ants that really caught my eye. I share some thoughts on these below, or you can listen to my Dear Science podcast this week for more on these stories. African acacia ants build their colonies in trees and are well known for their aggressive role in fending off large herbivores from their ‘tree house’ with a fierce bite. They also regard ant colonies from any other tree as mortal enemies. Ants are particularly aggressive to one another and fights can leave thousands dead on both sides. This has been hypothesized to leave post-fight colonies more vulnerable to further attack. A study by Kathleen Rudolph and Jay McEntee in Behavioural Ecology has demonstrated how some ant colonies have developed a novel way to offset this disadvantage – by recruiting ants from the losing side to boost their numbers. In a field study, the authors linked trees that support different colonies using rope, and monitoring mortality by counting dead ants beneath the ropes. Simulated browsing was used to show that colonies depleted by warfare were less able to defend their tree against browsing and presumably left them also less able to defend against another ant versus ant war. In a further experiment, molecular genetics showed that post-war populations where casualties were high actually showed signs of having fused with the invading population, so the two colonies had essentially become one. For any fans of the Clash of Clans app, I think there is a useful lesson here! All ants are not equal! The slave-making ant Polyergus breviceps sneaks into colonies of the formica ant (Formica altipetens) and forces them to work as slaves, caring for their offspring, foraging for food and maintaining the nest. A paper by Candice Torres and Neil Tsutsui in PLOS One reports how behaviour in free-living and enslaved formica ants living in Arizona was fundamentally different. In addition to their slave duties the captive ants were also far less aggressive than free ants. Genetic evidence indicated enslaved colonies were more genetically and chemically diverse than free ants, and this was rationalised as the result of raids by slave-master ants to secure pupa to become new slaves. The authors concluded that living in this diverse community lowered the response of ants to non-nest mates and hence made them less aggressive – which of course is highly desirable in a slave population. Ants can do what Derek Zoolander could not! If you have watched the hilarious movie Zoolander then you will recall male model Derek Zoolander had one fatal flaw in his catwalk routine – he couldn’t turn left! Well, it seems ants don’t have the same problem, and in the case of rock ants they may have taken it to an extreme level. 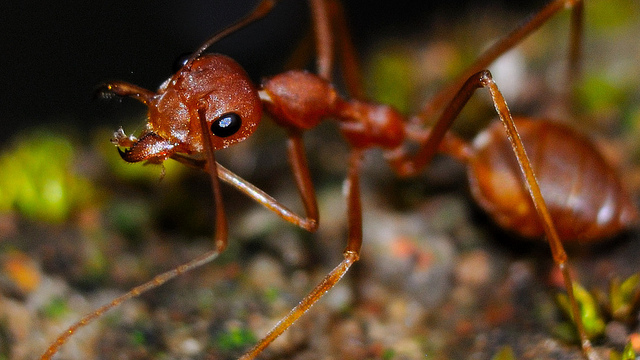 A not-so-recent study in Biology Letters by Edmund Hunt and co-workers revealed that when rock ants are exploring unknown spaces they show a left bias in any turning choice. This was demonstrated by challenging ants in mazes that simulated the branching mazes they would encounter in new nest cavities. So having established a left bias in these ants, what is the reason? The authors speculate that they may be using their eyes differentially – the left to detect predators and the right to navigate, but it is also known that consistently turning one way is one of the best ways to search and find your way out of a maze. And finally, ants are great at self-organising traffic on their trails to avoid the mayhem that so many of endure on SH1 every day! A German team found that as ant trails get busier due to a yummy food find, ants accelerate their speed by approximately 50% despite having no clear ‘lanes’ of traffic each way. This increased encounters between ants and it is thought to be important as they share information about that tasty food, but it does not lead to an increase in collisions – instead ants avoid collisions by moving – you guessed it – to the left to avoid each other! Featured image: Flickr CC, Chandan Kumar.